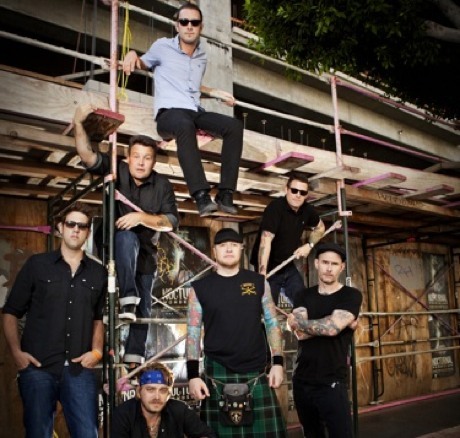 We already knew that we'd be getting a dose of Dropkick Murphys in 2012, as the long-running Celtic punk band will be touring North America with Frank Turner in February and March. Well, that's not all that the band have planned, since they're also gearing up for a new LP and a reissue. In a holiday message to fans, the Boston group wrote, "we are currently writing a brand new record that will be recorded in April and released in September. And it's pretty damn fun so far!!!!!" Given that recording hasn't even started yet, we don't have any more information than that, but rest assured that new material is on the way. What's more, the band will soon be re-releasing 2011's Going Out in Style as a deluxe edition that includes the bonus album Live at Fenway. This was already released on iTunes, but this new release will evidently have a video component too. There will also be a limited edition Live at Fenway vinyl release. The tracklisting from the iTunes release is below. Lastly, the band gave fans a holiday gift they certainly didn't expect and probably didn't want: a two-minute compilation of farts recorded by members of their road crew. Listen at the bottom of the page, if you're curious to hear the truly gross consequences of eating bad food on the road for weeks on end. Thanks to Punknews.org for the tip. 4. "Going Out In Style"
6. "Peg o' My Heart"
9. "Climbing a Chair to Bed"